The Attorney General is proposing to create jobs by lowering the value of the dollar vs. the yuan (China’s currency) to make China’s products a lot more expensive for US consumers, who are already struggling to survive. Those higher prices then cause us to instead buy products made elsewhere, which will presumably means more American products get produced and sold. The trade off is most likely to be a few more jobs in return for higher prices (also called inflation), and a lower standard of living from the higher prices. Fortunately there is an alternative that allows the US consumer to enjoy the enormous benefits of low cost imports and also makes good jobs available for all Americans willing and able to work. That alternative is to keep Federal taxes low enough so Americans have enough take home pay to buy all the goods and services we can produce at full employment levels AND everything the world wants to sell to us. This in fact is exactly what happened in 2000 when unemployment was under 4%, while net imports were $380 billion. We had what most considered a ‘red hot’ labor market with jobs for all, as well as the benefit of consuming $380 billion more in imports than we exported, along with very low inflation and a high standard of living due in part to the low cost imports. The reason we had such a good economy in 2000 was because private sector debt grew at a record 7% of GDP, supplying the spending power we needed to keep us fully employed and also able to buy all of those imports. But as soon as private sector debt expansion reached its limits and that source of spending power faded, the right Federal policy response would have been to cut Federal taxes to sustain American spending power. That wasn’t done until 2003- two long years after the recession had taken hold. The economy again improved, and unemployment came down even as imports increased. However, when private sector debt again collapsed in 2008, the Federal government again failed to cut taxes or increase spending to sustain the US consumer’s spending power. The stimulus package that was passed almost a year later in 2009 was far too small and spread out over too many years. Consequently, unemployment continued to rise, reaching an unthinkable high of 16.9% (people looking for full time work who can’t find it) in March 2010. The problem is we are conducting Federal policy on the mistaken belief that the Federal government must get the dollars it spends through taxes, and what it doesn’t get from taxes it must borrow in the market place, and leave the debts for our children to pay back. It is this errant belief that has resulted in a policy of enormous, self imposed fiscal drag that has devastated our economy. 1. A full payroll tax (FICA) holiday for employees and employers. This increases the take home pay for people earning $50,000 a year by over $300 per month. It also cuts costs for businesses, which means lower prices as well as new investment. 2. A $500 per capita distribution to State governments with no strings attached. This means $1.75 billion of Federal revenue sharing to the State of Connecticut to help sustain essential public services and reduce debt. 3. An $8/hr national service job for anyone willing and able to work to facilitate the transition from unemployment to private sector employment as the pickup in sales from my first two proposals quickly translates into millions of new private sector jobs. Because the right level of taxation to sustain full employment and price stability will vary over time, it’s the Federal government’s job to use taxation like a thermostat- lowering taxes when the economy is too cold, and considering tax increases only should the economy ‘over heat’ and get ‘too good’ (which is something I’ve never seen in my 40 years). (PELLEY) Is that tax money that the Fed is spending? (BERNANKE) It’s not tax money. The banks have– accounts with the Fed, much the same way that you have an account in a commercial bank. So, to lend to a bank, we simply use the computer to mark up the size of the account that they have with the Fed. Therefore, payroll tax cuts do NOT mean the Federal government will go broke and run out of money if it doesn’t cut Social Security and Medicare payments. As the Fed Chairman correctly explained, operationally, spending is not revenue constrained. We know why the Federal government taxes- to regulate the economy- but what about Federal borrowing? As you might suspect, our well advertised dependence on foreigners to buy US Treasury securities to fund the Federal government is just another myth holding us back from realizing our economic potential. Operationally, foreign governments have ‘checking accounts’ at the Fed called ‘reserve accounts,’ and US Treasury securities are nothing more than savings accounts at the same Fed. So when a nation like China sells things to us, we pay them with dollars that go into their checking account at the Fed. And when they buy US Treasury securities the Fed simply transfers their dollars from their Fed checking account to their Fed savings account. And paying back US Treasury securities is nothing more than transferring the balance in China’s savings account at the Fed to their checking account at the Fed. This is not a ‘burden’ for us nor will it be for our children and grand children. Nor is the US Treasury spending operationally constrained by whether China has their dollars in their checking account or their savings accounts. Any and all constraints on US government spending are necessarily self imposed. There can be no external constraints. In conclusion, it is a failure to understand basic monetary operations and Fed reserve accounting that caused the Democratic Congress and Administration to cut Medicare in the latest health care law, and that same failure of understanding is now driving well intentioned Americans like Atty General Blumenthal to push China to revalue its currency. This weak dollar policy is a misguided effort to create jobs by causing import prices to go up for struggling US consumers to the point where we buy fewer Chinese products. The far better option is to cut taxes as I’ve proposed, to ensure we have enough take home pay to be able to buy all that we can produce domestically at full employment, plus whatever imports we want to buy from foreigners at the lowest possible prices, and return America to the economic prosperity we once enjoyed. Should America Kowtow to China? First Published on New Deal 2.0. Do the Chinese really fund our deficit? Or is this more Neo-classical money mythology? The Times actually does believe this to be true. They refer to China’s role as America’s largest “creditor” as a “stark fact”. They do not seem to understand that simply because a country issuing debt which it creates, it does not depend on bond holders to “fund” anything. Bonds are simply a savings alternative to cash offered by the monetary authorities, as we shall seek to illustrate below. “Is there a way for the Chinese manufacturing firm to turn a profit? Yes: the alternative to selling on the domestic market is to export. And export prices, even those paid at wholesale, must be multiples of those obtained at home. But the export market, however vast, is not unlimited, and it demands standards of quality that are not easily obtained by neophyte producers and would not ordinarily be demanded by Chinese consumers. Only a small fraction of Chinese firms can actually meet the standards. These standards must be learned and acquired by practice.” (”The Predator State, Ch. 6, “There is no such thing as free trade”, pg. 84). What about the US government? What should it do? Should it actually respond to China’s complaints by trying to “defend the dollar”? I hear this recommendation all of the time in the chatterplace of the financial markets, but seldom do those who fret about the dollar’s declining level actually suggest a concrete strategy to achieve the objective. In fact, it is unclear to me that there is any measure the Fed or Treasury could adopt which might support the dollar’s external value. But wait? Don’t the Chinese (and other external creditors) “fund” our deficit? And won’t they demand a higher equilibrating interest rate in order to offset the declining value of their Treasury hoard? Again, this displays a seriously lagging understanding of how much modern money has changed since Nixon changed finance forever by closing the Gold window in 1973. Now that we’re off the gold standard, the Chinese, and other Treasury buyers, do not “fund” anything, contrary to the completely false & misguided scare stories one reads almost daily in the press. “And the way we pay them is somebody pays China. And the money goes into their checking account at the Federal Reserve. Now, it’s called a reserve account because it’s the Federal Reserve, and they give it a fancy name. But it’s a checking account. So we get the T-shirts, and China gets $1 billion in their checking account. And that’s just a data entry. That’s just a one and some zeroes. Whoever bought them gets a debit. You know, it might have been Disneyland or something. So we debit Disney’s account and then we credit China’s account. In this situation, we’ve increased our trade deficit by $1 billion. But it’s not an imbalance. China would rather have the money than the T-shirts, or they wouldn’t have sent them. It’s voluntary. We’d rather have the T-shirts than the money, or we wouldn’t have bought them. It’s voluntary. So, when you just look at the numbers and say there’s a trade deficit, and it’s an imbalance, that’s not correct. That’s imbalance. It’s markets. That’s where all market participants are happy. Markets are cleared at that price. The example here clearly illustrates that bonds are a savings alternative which we offer to the Chinese manufacturer, not something which actually “funds” our government’s spending choices. It demonstrates that rates are exogenously determined by our central bank, not endogenously determined by the Chinese manufacturer who chooses to park his dollars in treasuries (credit demand, by contrast, is endogenous). Yet we are constantly being told by the financial press that the dollar’s weakness was supposed be the factor that would “force” the Fed to raise rates, since the Chinese supposedly “fund” our deficits. So far, that thesis hasn’t been borne out. And it won’t be, because this isn’t how things operate in a post gold-standard world. Of course, higher rates can have an offsetting beneficial income impact (what Bernanke calls the “fiscal channel”), but it does not follow that a decision to raise rates would actually elevate the value of the dollar (and the benefits of higher rates from an income perspective could just as easily be achieved via lower taxation). So it is unclear to me what the Tsy or Fed should be doing about the dollar. My view is that this is a private portfolio preference shift and I don’t think central banks should be responding to every vicissitude of changing market preferences. The US government should simply ignore the market chatter and idle threats from the Chinese and do nothing. There is a great deal of confusion over international “flows” of currency, reserves, and finance, much of which results from failure to distinguish between a floating versus a fixed exchange rate. For example, it is often claimed that the US needs “foreign savings” in order to “finance” its persistent trade deficit that results from “profligate US consumers” who are said to be “living beyond their means”. Such a statement makes no sense for a sovereign nation operating on a flexible exchange rate. In a nation like the US, when viewed from the vantage point of the economy as a whole, a trade deficit results when the rest of the world (ROW) wishes to net save in the form of dollar assets. The ROW exports to the US reflect the “cost” imposed on citizens of the ROW to obtain the “benefit” of accumulating dollar denominated assets. From the perspective of America as a whole, the “net benefit” of the trade deficit consists of the net imports that are enjoyed. In contrast to the conventional view, it is more revealing to think of the US trade deficit as “financing” the net dollar saving of the ROW—rather than thinking of the ROW as “financing” the US trade deficit. 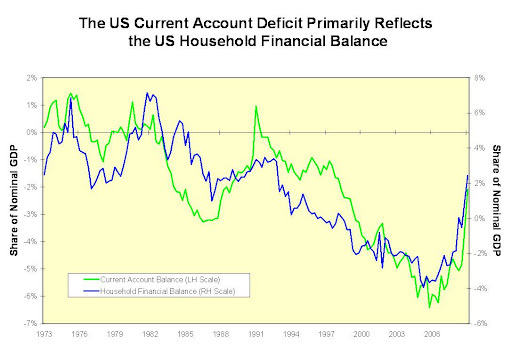 If and when the ROW decides it has a sufficient stock of dollar assets, the US trade deficit will disappear. It is sometimes argued that when the US experiences a capital account surplus, the dollars “flowing in” will increase private bank reserves and hence can lead to an expansion of private loan-and-deposit-making activity through the “money multiplier”. However, if the Fed “sterilizes” this inflow through open market sales, the expansionary benefits are dissipated. Hence, if the central bank can be persuaded to avoid this sterilization, the US can enjoy the stimulative effects. Previous analysis should make it clear that sterilization is not a discretionary activity. First it is necessary to understand that a trade deficit mostly shifts ownership of dollar deposits from a domestic account holder to a nonresident account holder. Often, reserves do not even shift banks as deposits are transferred from an account at a US branch to an account at a foreign branch of the same bank. Even if reserves are shifted, this merely means that the Fed debits the accounts of one bank and credits the accounts of another. These operations will be tallied as a deficit on current account and a surplus on capital account. If treasury or central bank actions result in excess reserve holdings (by the foreign branch or bank), the holder will seek earning dollar-denominated assets—perhaps US sovereign debt. US bond dealers or US banks can exchange sovereign debt for reserve deposits at the Fed. If the net result of these operations is to create excess dollar reserves, there will be downward pressure in the US overnight interbank lending rate. From the analysis above, it will be obvious that this is relieved by central bank open market sales to drain the excess reserves. This “sterilization” is not discretionary if the central bank wishes to maintain a positive overnight rate target. Conversely, if the net impact of international operations is to result in a deficit dollar reserve position, the Fed will engage in an open market purchase to inject reserves and thereby relieve upward pressure that threatens to move the overnight rate above target. With PDFB the private domestic financial balance, RWFB the financial balance of the Rest of the World, and GFB the government financial balance. This identity holds all the time, in any domestic economy (in a world economy RWFB disappears). For economic analysis, it is insightful to arrange this identity differently in function of the type of monetary regime. In a country that is monetarily sovereign the federal government has full financial flexibility. By monetary sovereignty, one means that there is a stable and operative federal/national government that is the monopoly supplier of the currency used as ultimate means of payment in the domestic economy, and that the domestic currency is not tied to any asset (like gold) or foreign currency. Other posts have already explained the implications of this in terms of federal government finance (taxes and T-bonds do not act as financing sources for federal government spending, the federal government always spends by creating monetary instruments first, etc.) and banking (bank advances create deposits, credit supply is endogenous and is created ex-nihilo (i.e. banks do not need depositors to be able to provide an advance of funds to deficit spending units), higher reserve ratios do not constrain directly the money supply process in a multiplicative way, etc.). All this also has implications in terms of accounting and in terms of modeling. Where NGFB is the non-government financial balance (the sum of the financial balance of the private domestic sector and the Rest of the World). 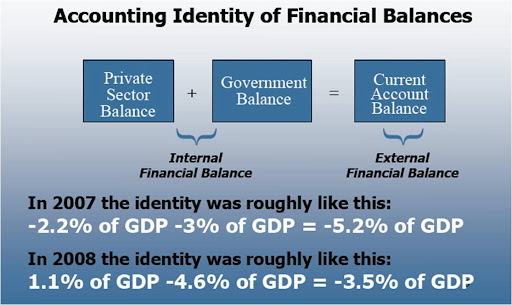 This way of arranging the identity shows well that the government sector (through its federal branch) is the ultimate provider/holder of domestic currency: government fiscal deficit (surplus) is always equal to non-government financial surplus (deficit). The graph below shows the identity for the US. Note: Statistical discrepancy was distributed evenly among the three sectors (Private Domestic, Rest of the World, and Government). Any net injection of dollars (i.e. financial deficit) by any sector must be accumulated somewhere else (i.e. financial surplus). As the monopoly supplier of ultimate domestic means of payment, usually the US government sector is the net injector of dollars, while the private domestic sector and the Rest of the World usually accumulate the dollars injected. For a while, like from 1997 to 2007 in the US, the private domestic sector and the Rest of the World may transfer the domestic currency among each other while the government runs a surplus; however, this cannot last because ultimately one of them (private sector or Rest of the World) will run out of domestic currency and/or will have to become highly indebted in domestic currency leading ultimately to a Ponzi process that collapses. Only the federal government has a perfect creditworthiness and can always meet its financial obligations denominated in the domestic currency (that is why US Treasury bonds are not rated, default rate is zero). In addition, one may note that the Rest of the World and the private sector cannot accumulate any domestic currency unless the government sector injects them in sufficient quantity in the first place. Stated alternatively, the Rest of the World (e.g., the Chinese) does not help to finance the deficit of the federal government (US federal government). On the contrary, the federal government deficit allows the Rest of the World to accumulate dollars. This pressure to generate a deficit is all the more strong on the dollar that it is the reserve currency of the world, so there is a net demand for the dollar from the Rest of the World. This also works the other way around, i.e. if the Rest of the World disaccumulates the domestic currency the government must be the ultimate acquirer of this domestic currency and so must run a surplus if the private domestic sector does not accumulate it in a large enough quantity. Once it acquires the domestic currency, the government may destroy them (federal government has huge shredders or they are deleted from the computer memory), or store them into a safe/computer for later use (especially true for state and local governments). Destruction of bank notes occurs usually because they are in bad shape. Hundreds of millions of dollars worth of bank notes are destroyed every month at the Fed banks in the US; then they are used as compost (during my last tour of the San Francisco Fed last March, I was told that about $56 million worth of bank notes are destroyed every day at the SF Fed, and then are spread on the fields of California). If you go visit a fed bank this will be the main attraction. Besides the poor condition of some bank notes, the destruction of dollars by the federal government may also occur for other reason, e.g., because there is a lack of storage capacity (safe is too small, computer memory is too small). One central point is that the dollars that are accumulated by the federal government do not increase its financing capacity because the federal government created those dollars in the first place. It chooses not to destroy them all because it takes time and it is costly to destroy and to make monetary instruments, and because it has the storage capacity. For the moment, we stayed at the level of the identity, which basically tracks where the domestic currency comes from and where it goes. Every dollar comes from somewhere and must go somewhere. There is no dollar floating around that is not held by a sector. No desire/behavioral equation were included in the analysis above. However, even that basic identity provides us a powerful insight. Indeed, it shows us that it is impossible for all sectors to be in surplus; at least one of them must deficit spend and usually it is the government sector because of its monetary sovereignty. The reverse is also true, i.e. not all sectors can be in deficit at the same time; at least one of them must be in surplus (usually the private domestic sector). As Randy noted in a previous post, this is probably not understood well; even the Wall Street Journal did not make the connection in early the 2000s between the federal government surplus and the households’ negative saving. It is often assumed that if they wish, all sectors could be in surplus; one just needs to work hard enough at it (note that this is one of the promises that is always made during presidential campaigns: “we should save more, reduce our trade deficit and reach a fiscal surplus”). Economic reality does not work that way. In terms of the model (where one includes desires and so behavioral aspects as well as an explanation of the adjustment mechanisms to those desires in relation to the state of the economy), for the analysis of a monetarily sovereign country, I would rather put the desired financial balance of the Rest of the World with the desired private domestic financial balance and call the sum the desired financial balance of the non-government sector (NGFBd). The model does not deal with stocks at all and their relation to flows (IS-LM did try but failed to do it correctly; read Hicks’s own account in his JPKE article “IS-LM: An explanation”); however, the financial-balance model is a good place to start in Econ 101. If students can understand the model, the identity and how they relate to each other, it would be a HUGE step forward in terms of removing this counterproductive phobia of government fiscal deficits (then one would have to learn about government finance and the monetary creation process, which, like many other things, are all taught backward in textbooks). If the Rest of the World has too many dollars relative to its taste it and cannot bring them back into the domestic economy, by buying enough goods and services or financial assets from the private domestic and government sectors, the currency depreciates and/or long-term interest rate falls. This boosts exports and reduces imports. This may also promote investment and consumption if the state of expectations is stable. If the non-government sector desires to save more, then, unless the government sector increases its spending propensity or reduces tax rates, the economy will enter a slump; possibly a debt-deflation process if debt levels are far too high. All this was done nicely in previous posts. Before, during, and after the adjustment processes (variation of flows, levels and prices) the identity holds and the actual financial balance always sum to zero. The sum of GFBd and NFGBd will be different from zero except when the adjustment is completed, i.e. when actual and desired balances are equal (“at equilibrium” if you want to call it that way, even though markets may not be cleared). Paul Krugman’s July 15th blog post diagramming financial balances makes some important steps in revealing the analytical power of the financial balance approach to macroeconomics – something once understood by J.M Keynes and early Keynesians like Nicholas Kaldor, Abba Lerner, and Joan Robinson, but long since lost in the headlong rush over the past three decades of mainstream macroeconomics to become a special branch of microeconomics, which itself appears to have become a special branch of applied calculus in some sort of rather twisted physics envy. I suspect reading Minsky has helped Paul immeasurably in seeing these relationships, and I would urge him and others to go find some of Wynne Godley’s contributions (many of which are available online at the Levy Economics Institute) to a stock/flow coherent macroeconomics, and it may all become that much clearer. The diagram Paul presented at first (reproduced below) threw me for a loop, but I believe I now see what he was doing, as the labeling did not initially make it clear, and perhaps by walking through Paul’s diagram, others can avoid my initial confusion. The upward sloping line should be labeled the private sector financial balance (PSFB), and the downward sloping line should be labeled the government financial balance (GFB). Only the part of the PSFB schedule above the horizontal axis is in surplus, if this horizontal GDP axis crosses the vertical sectoral financial balance axis at zero. Similarly, only that part of the GFB schedule above the horizontal axis is in deficit. I believe Paul has defined the vertical axis such that the range above zero represents a rising PSFB, and at the same time, a falling GFB of the same absolute amount, but of opposite sign. Then the area below zero is a falling PSFB and a rising GFB. Above zero represents a private sector financial surplus and a government deficit, while below zero represents a private sector deficit and a government surplus. Confusing at first, but this follows because Paul has simplified the analysis to two sectors, and sectoral financial balances must balance ex post for any accounting period. The range above zero representing a private sector surplus must also represent a government deficit (GFB must be of equal magnitude but opposite sign to the PSFB). This would seem consistent with Paul’s GFB schedule falling below zero as GDP increases, since a falling fiscal deficit would eventually give way to an increasing fiscal surplus as income increases if automatic stabilizers work as we believe they do (see previous post here). Similarly, the rising PSFB schedule is consistent with traditional Keynesian stability conditions, with saving increasing faster in income than investment does, although we should all keep in mind, as Minsky emphasized, that explosive growth dynamics (Minsky’s upward instability) can arise in economic expansions characterized by euphoric asset pricing. Hence, the last two US business cycle expansions have been characterized by a falling PSFB (that is, deficit spending by the household and business sectors combined), not a PSFB rising as income rises, but that can be accommodated in less simplified versions of Krugman’s cross. 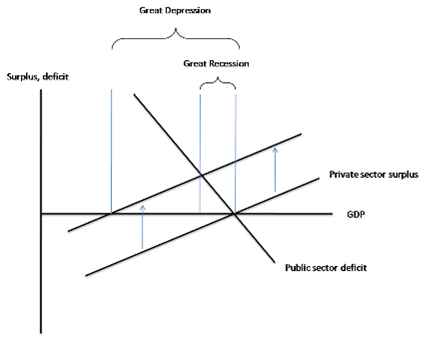 Another way to see why this interpretation of the diagram must be correct is that when the PSFB schedule shifts up and to the left, representing a higher desired net private saving at each level of income, the new point of intersection with the GFB schedule would, for example represent a new short run equilibrium point where say a $250b net private saving position is met by a $250b fiscal deficit. Again, sectoral financial balance must balance ex post (as explained in prevoius posts here and here). 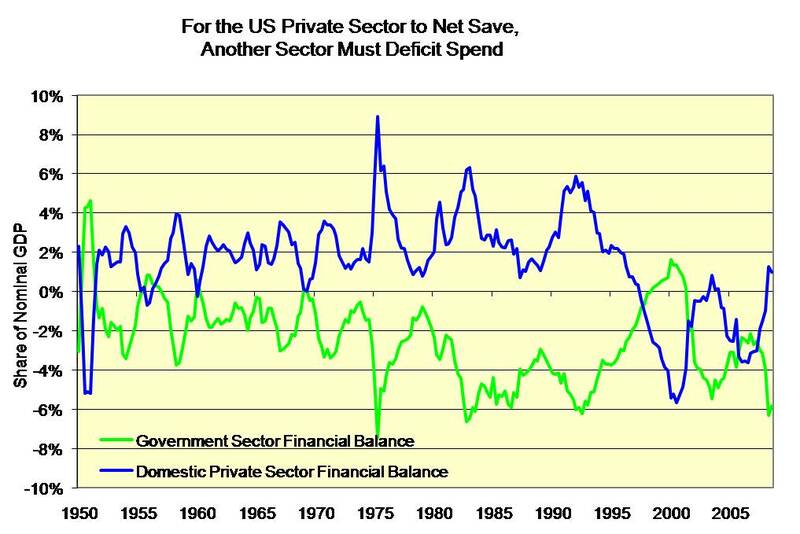 If one sector is running a net saving or surplus position, the other sector must be dissaving or deficit spending. That is the tyranny of double entry book keeping – not high Keynesian theory. If I now have the orientation of the diagram straight in my head (and this is the only way I can see that it makes sense), those who believe in fiscal rectitude may wish to notice two aspects of the world we live in. If you view a balanced fiscal budget as the ultimate and over riding goal, you can get there one of two ways from Paul’s second PSFB schedule (the higher line we seem to have shifted to, as asset prices and profitability have collapsed over the past year, thereby forcing lower private investment and driving saving out of private income flows higher). To arrive at a fiscal balance, you can shift the GFB schedule down and to the left by jamming tax rates higher and lowering the government spending propensities out of tax revenue income until the GFB schedule intersects the PSFB schedule at the point where the PSFB schedule crosses the horizontal axis at the zero financial balance mark. Notice the level of income the economy is then operating at, and all of you who pay dues to the Concord Coalition, please consider whether existing private debt loads could actually be serviced at that lower level, since most private debt contracts are fixed nominal payment commitments. Think post Lehman bankruptcy, on steroids, and you might get a taste of what you are praying for with perpetually balanced fiscal budgets. The second way to get to a fiscal balance is to encourage the PSFB schedule to shift down and to the right until it intersects the GFB schedule at the point at which it crosses the horizontal axis. That means increasing incentives for the private sector to invest more money at each income level and save less money at each income level. Given the residential housing stock overhang, and the need for households to save out of income flows if they cannot rely on serial asset bubbles to deliver the appropriate nominal net worth at retirement, that means ways must be found to encourage US businesses to pursue a higher reinvestment rate in the US, rather than borrowing money to buy back shares to boost stock prices or reinvesting abroad. Not easy, but not impossible either. Notice also that the second form of adjustment leaves you at a higher equilibrium income level, and the existing private debt to GDP ratio will stabilize, since there will be no additions to the private debt stock, as net private deficit spending is zero at the new income flow level. Of course, this should all eventually be recast in dynamic terms. For example, income won’t grow unless the GFB is continually shifting up and to the right, or the PSFB is continually shifting down and to the right (or some combination of the two). There is also no obvious endogenous mechanism shifting the PSFB toward a position of full employment income over time, given the position of the GFB. Of course, in theory, policy could be geared such that given reasonable estimates of the likely position of the PSFB schedule, the GFB schedule could be shifted out (or less likely, in) to achieve the level of income associated with full employment. Alternatively, fiscal policy could be structured so the GFB schedule could be perfectly vertical at the full employment level of income, which in many ways is what an employer of last resort (ELR) driven fiscal policy attempts to do. Finally, for those insistent that public and private debt to income ratios must be held fixed from here to eternity for whatever reason, then starting from Paul’s initial equilibrium, income growth could only be accomplished if the PSFB schedule could be encouraged to shift outward, and the GFB could be shifted in concert such that either the realized financial balances of both sectors were kept at zero, or there was some cycling between the two, such that periods of private sector financial deficits were followed by periods of government sector deficits of similar magnitude and duration. The trade balance must also be brought back into the story, as a trade surplus is the only way both the GFB and the PSFB can maintain a net saving position at the same time (assuming for whatever reason that was a worthy goal), but at least it is a promising start at representing how sectoral financial balances are related, and it reveals many of the misconceptions that unnecessarily cloud the debate. If the Krugman Cross does nothing more than provide a stepping stone away from the dead end trap of the Hicks/Harrod/Meade IS/LM diagram, then this is a useful initial contribution. Caught under the spell of IS/LM conventions, Paul and other New Keynesians have spilled far too much ink trying to devise ways of instituting negative real interest rates to get the economies out of a balance sheet driven recession. With policy rates near zero, this analysis has devolved into arguments about how best to increase inflation expectations or actual inflation in order to achieve a sufficiently negative real interest rate. From a practical point of view, the last thing households facing heavy debt servicing loads with falling wage and salary incomes need are rising consumer prices that drain their already reduced discretionary income. Households need higher money incomes, not higher consumer prices, expected or actual, to exit their current difficulties. Real interest rates are diversion from the real problem at hand in a balance sheet recession, which is how to get the economy to a point where money income levels can service most private debts. Krugman’s Cross makes it obvious – shift the GFB schedule in response to shifts in the PSFB schedule. As always, we must be careful about sliding between the usual ex ante/ex post distinctions, as the income multiplier lies masked behind these interactions, as does the reconciliation of new liability issuance with portfolio preferences, among other balance sheet and asset price considerations that must be brought into play for a coherent stock/flow macroeconomics, of which Hick’s IS/LM approach was a pale shadow that concealed more than it revealed. For example, the private sector may plan to net save more at any given expected income or GDP level, but unless some other sector net saves less or deficits spends more, private incomes will adjust downward, and the desired private net saving will be thwarted, paradox of thrift style. If Paul recalls his reading of Keynes’ General Theory (and he is to be applauded for being one of the few New Keynesians to actually read Keynes in the original), this is one of the reasons Keynes argues incomes adjust to close gaps between intended investment and planned saving. Interest rates do not equilibrate investment and saving – incomes do, in Keynes’ General Theory. Paul has taken a very large step in this direction with his financial balance diagram, which hopefully he will find more powerful than his IS/LM analytics which he employed in the case of the Japanese balance sheet recession. Specifically, Paul refers to the need for net private saving being “absorbed” by the public deficit spending. That assumes the net private saving can exist without some other sector deficit spending at the same time, which is impossible. William Vickrey and James Tobin used to make a similar slip, with Vickrey arguing the private saving had to be recycled by public deficit spending (see Vickrey’s otherwise useful piece on 15 fundamental fallacies, linked at CFEPS here. In Paul’s 2 sector model, unless the public sector spends more money than it takes in as tax receipts, the private sector cannot earn more money than it spends, no matter what its plans or intentions or ex ante designs. 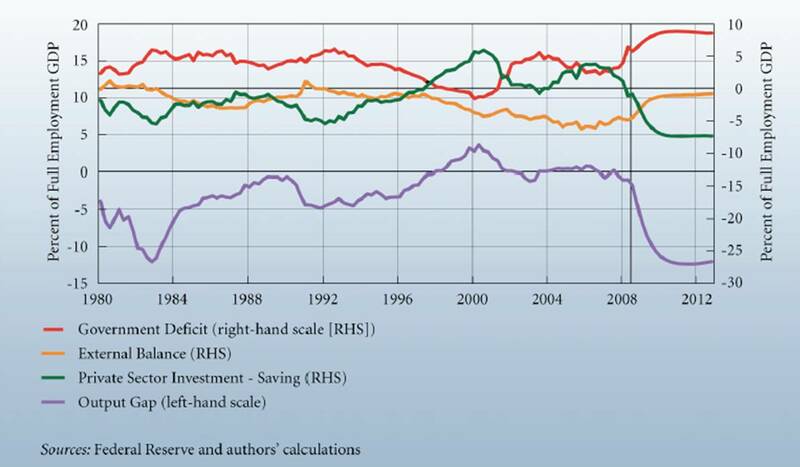 Net private saving is created, allowed, or constrained by the size of the public deficit. Net private saving cannot exist as anything more than a hope and a prayer unless some other sector is willing and able to deficit spend. Ex post, in a 2 sector model, as a matter of basic accounting, the net saving of one sector must be equal to the net deficit spending of the other. That is the short run accounting “equilibrium” or reality. Moving beyond a simple 2 sector model to the world we actually inhabit, it is really as simple as this. The US household sector cannot net save in nominal terms (spend less money than it earns) unless some other sector (or combination of sectors) is willing and able to spend more money than it earns. It can be the government, the business, or the foreign sector or some mix of the three that net deficit spends – take your choice. But keep in mind, of the three, a government with a sovereign currency (not convertible into fixed quantities of a commodity or another currency on demand) and no debt denominated in foreign currencies is the only one of those three that cannot go bankrupt and cannot default on its debt while continuously deficit spending – unless it chooses to default for some odd political reason. The sooner we face this fundamental reality of contemporary monetary and economic arrangements, the better. It does not require swearing allegiance to high Keynesian theory – it is simply an accounting reality. Reject it, and you will also have to throw at least seven centuries of double entry book keeping out the window as well. Since the US economy does appear to have entered a debt deflation spiral for the first time in a lifetime, and it does appears that the spiral has been contained for the moment by a reduction in the trade deficit and a surge in the fiscal deficit, it might be a good time for economists, investors, policy makers, and the general public to once and for all find some clarity on these questions regarding financial balances and the economy. Perhaps Paul’s simple back of the napkin diagram of financial balances takes us one step in that direction. Once again, we find it necessary to point out the flawed logic of those who certainly ought to have a better understanding of things. First, taxes do not pay for government spending. It would help a great deal if those at the CBO (and elsewhere) would work through the balance sheet entries to decipher exactly how government “financing” operations work. As Kelton and Wray have explained in earlier posts, the federal government spends by crediting bank accounts. Period. Tax payments to the government result in the destruction of money — high-powered money to be exact — as the banking system clears the checks and reserve accounts are debited. In other words, taxes don’t provide the government with “money to spend”. Tax payments destroy money. Not in theory. Not by assumption. By definition. This fundamental accounting identity can be found in any decent International Economics texbook (see, e.g., Krugman and Obstfeld), and it is one of the most important macroeconomic concepts we can think of. It demonstrates the conditions under which national savings will be positive. Not in theory. Not by assumption. By definition. To appreciate the interplay, consider the main sector balances in 2004. The public sector’s deficit of about 5% of GDP was just enough to offset the 5% current account deficit, leaving the private sector with no addition to its net saving (i.e. private sector savings were zero). Today, in contrast, private savings are up sharply because: (1) the public deficit is up sharply and (2) the external deficit is declining. Add today’s (rising) public deficit to today’s (falling) current account deficit and, voila, the CBO’s much-feared explosion in the government deficit has translated into an explosion in private savings. As for the relationship between savings and investment . . . let’s tackle that accounting lesson next week. Update: See some Wynne Godley’s pieces here, here , and here. See also Krugman’s piece here.